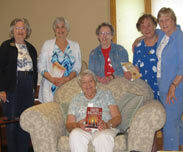 Afternoon Books usually meets on the second Monday of the month at 1 PM at the home of a member. Contact Mary Ann for the location of the next meeting. The meeting place may vary from month to month.